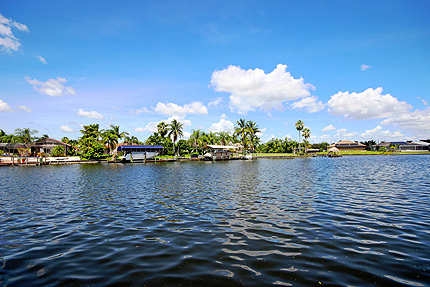 Close your eyes and imagine - you will return to this place everyday in your mind and in your heart and under the ever-changing skies. 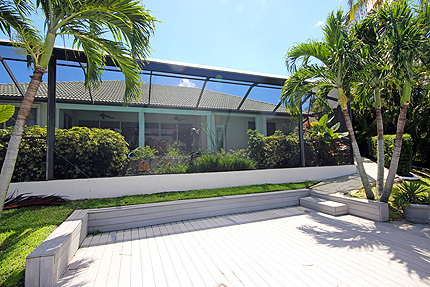 This magnificent home has a magical island atmosphere combined with the very latest in hi-tech luxury features. Custom decorated, fully air-conditioned and luxuriously furnished throughout, the great room has soaring ceilings with stylish Bahaman fans and window blinds. 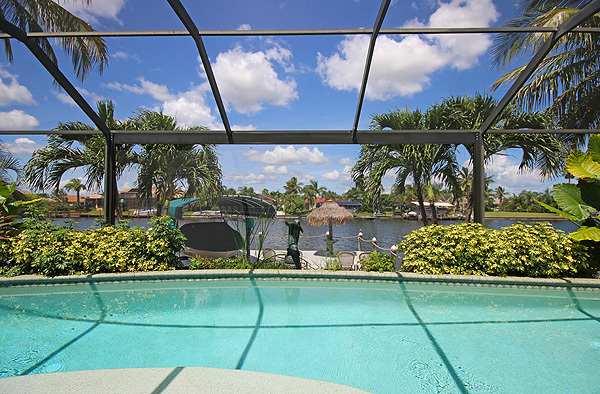 The home offers sophisticated luxury living at its finest, with dramatic retractable pool-side doors opening directly to the deck and providing stunning panoramic views of the waterfront. 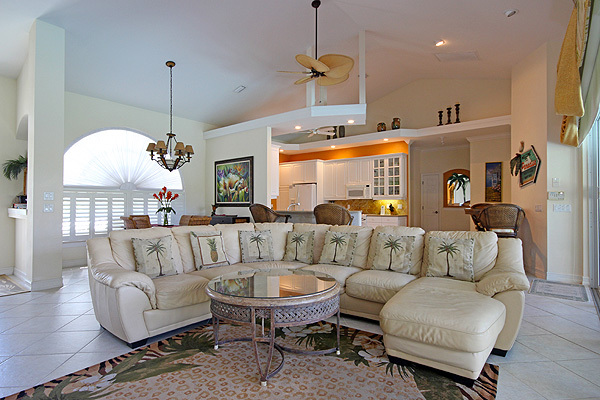 Leather sofas, large screen TV, DVD, CD and stereo surround sound are just some of the luxury features of this home. 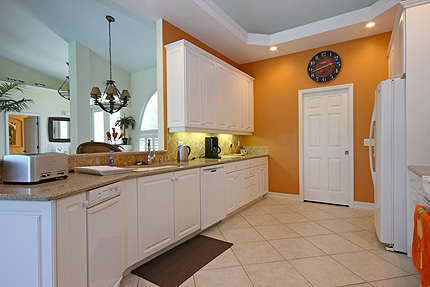 The architect inspired kitchen is luxuriously appointed with granite counter tops and equipped with family size refrigerator, freezer, dishwasher, glass top stove, microwave oven and an extensive selection of quality appliances. 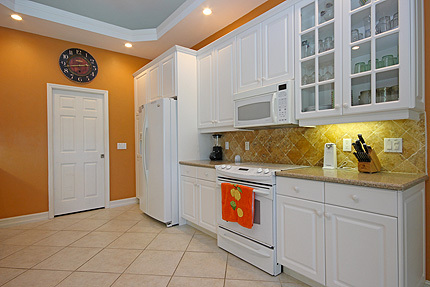 A walk-in utility room has family washer and dryer. Separate breakfast bar and café style breakfast table provides casual dining with views of the pool and sun deck. 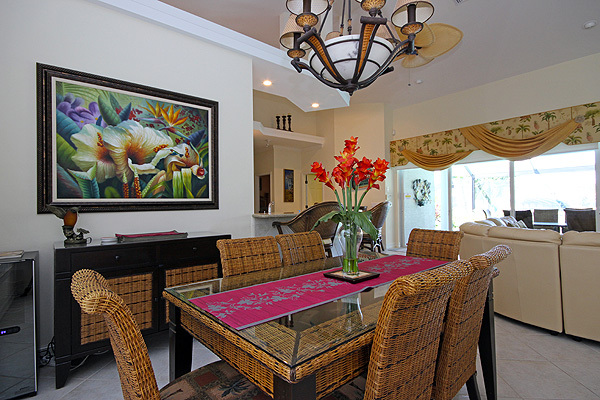 A hand crafted island-style dining table with seating for six provides for a more formal dining experience. A walk-in utility room has family washer and dryer. 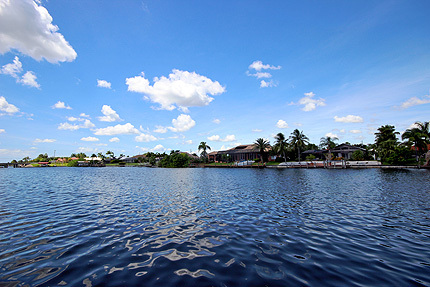 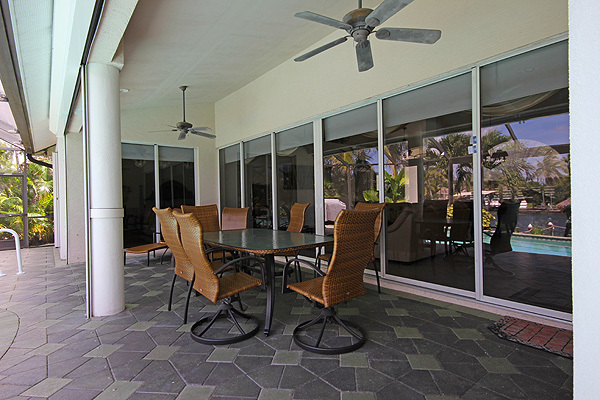 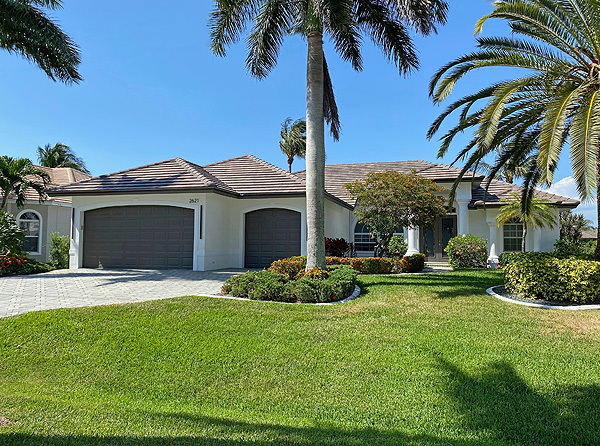 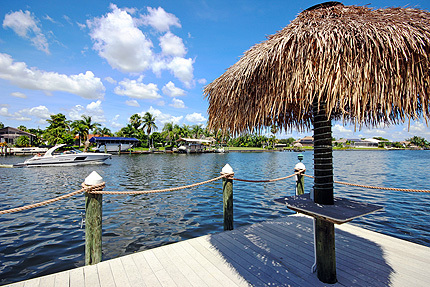 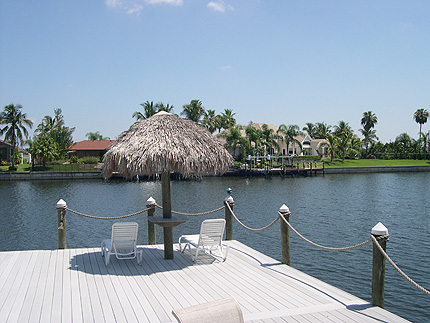 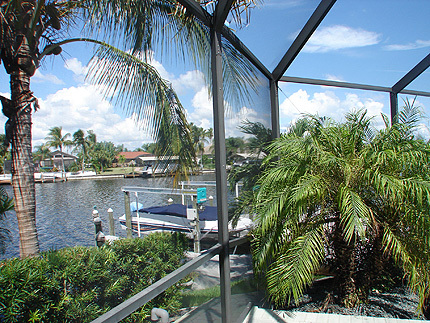 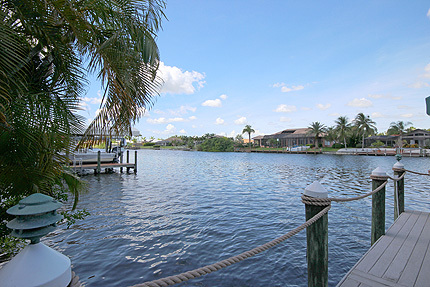 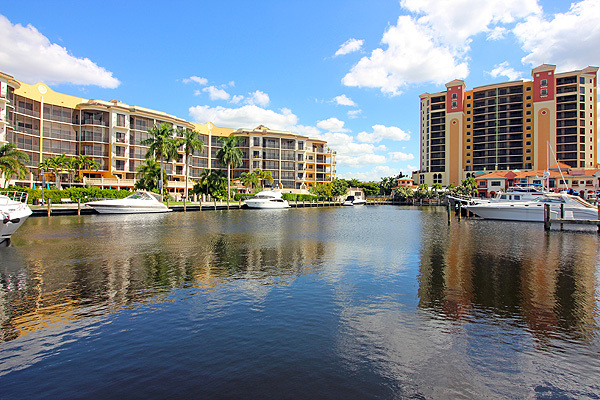 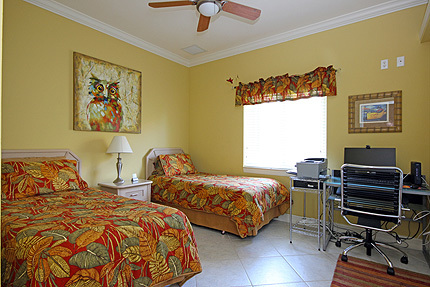 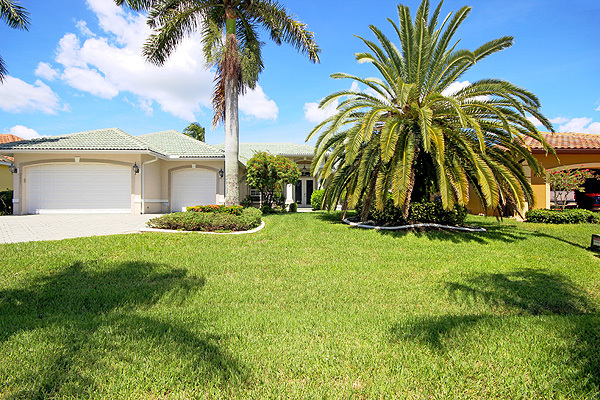 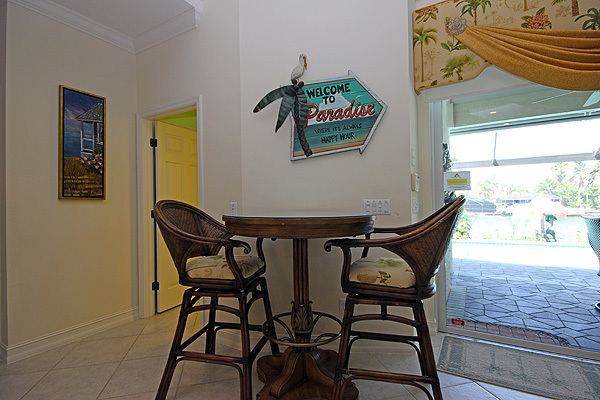 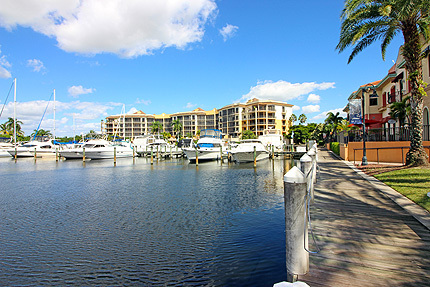 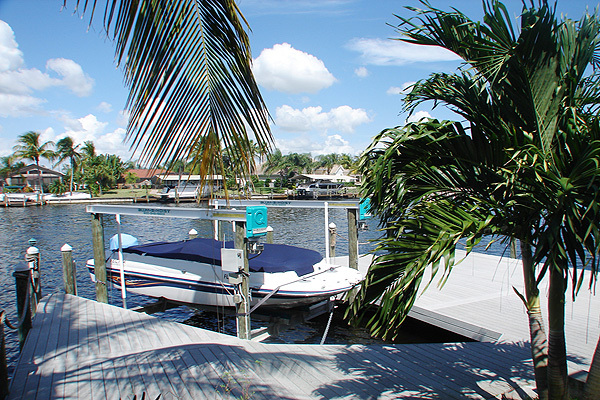 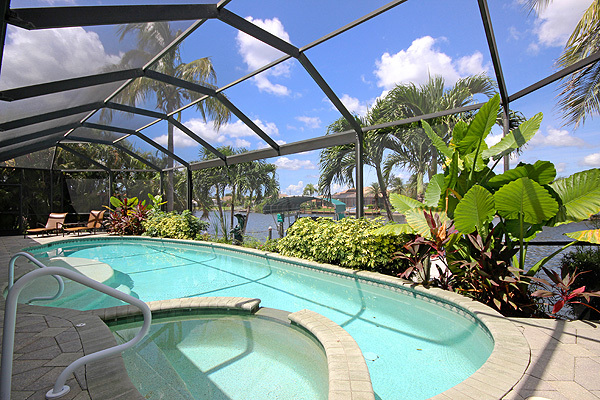 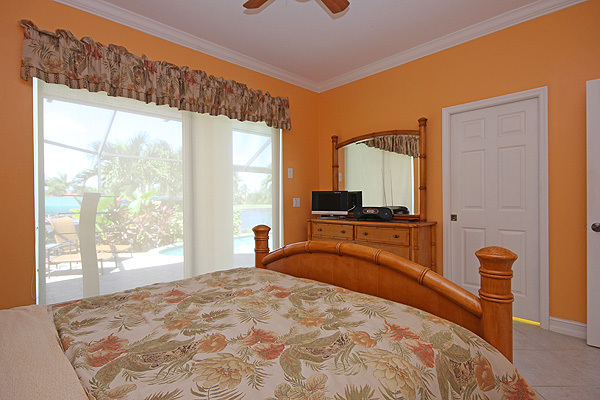 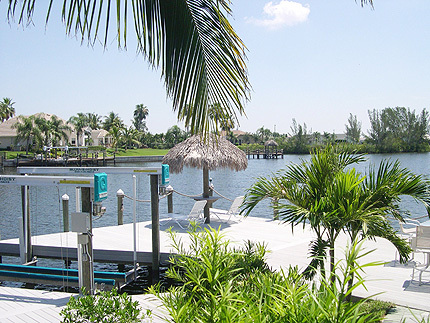 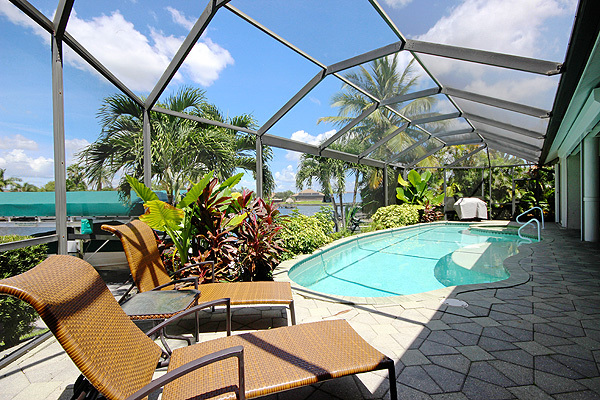 Feature: Home with maximum privacy -10 minutes drive from Cape Coral Beach & "The Boat House" beachside restaurant. 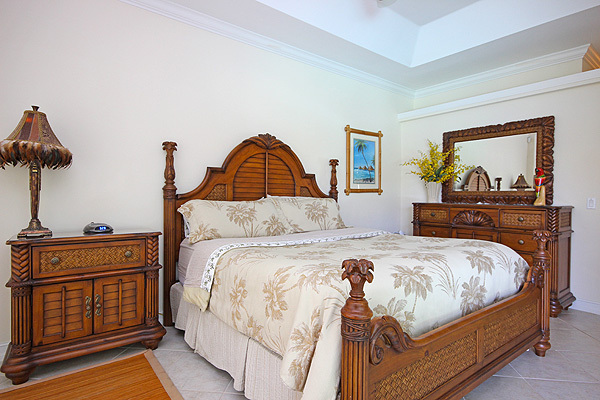 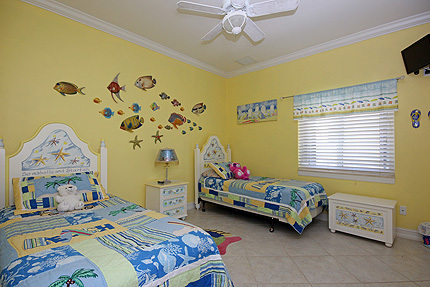 Master bedroom suite features luxury island-style king size bed, Bahaman-style fans, full dresser with mirror, T V. – direct access to the pool deck and extensive water views. 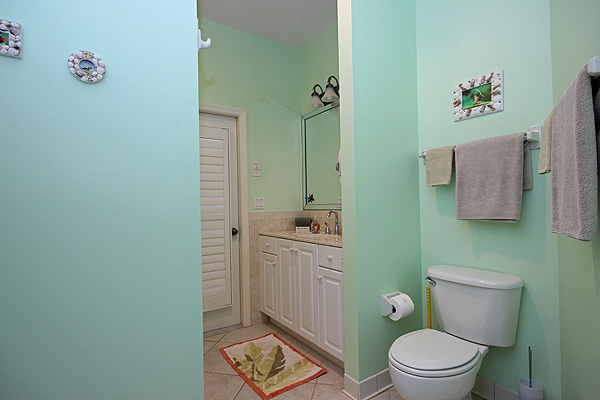 The en-suite bathroom features, walk-in shower with bench seat, spa bath, separate toilet, twin vanity units and walk-in closet. 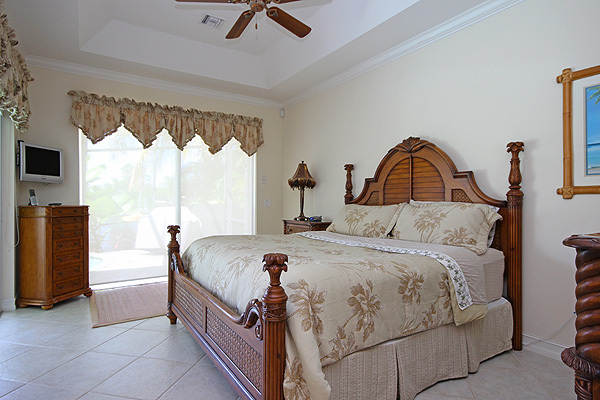 Second Master bedroom suite features queen-size bed, full dresser and mirror, double closets, TV – direct access to the pool deck and extensive water views. Features over-bath glass screen shower, single vanity and toilet. 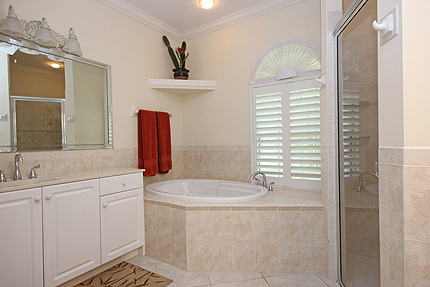 This bathroom also has direct access out to the pool deck. Features twin beds, double closet and additional TV.